ONE DIRECTION, WHAT GOES ON. This is probably the craziest week to be a 1D fan since Zayn Malik quit the band back in March 2015 (and what a damn week that was). First, we have Harry Styles turn into the second coming of both Mick Jagger and Paul McCartney and appear on three different covers for AnOther Man magazine, channeling the throwback look of rockers past and also wearing a leather choker around his neck. Then, out of nowhere, Niall Horan comes through and gives us #SoloNiall, a surprise move complete with a surprise single, "This Town." This is all to say that 1D is clearly going in five different directions here, and they're all doing it at once. Though 1D initially insisted that their break was just a "hiatus," that "hiatus" only became more permanent once the guys started revealing their solo careers. In fact, Styles' most recent comments in AnOther Man — he told the mag that he "would never say we'll never do anything again but it's good for us to be exploring different things" — only confirm that the guys are all going their separate ways (for now, at least). 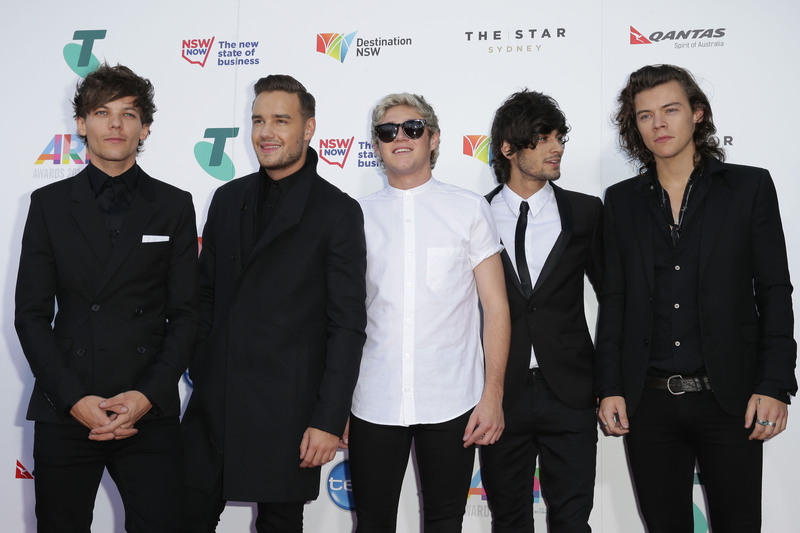 What are the guys of One Direction up to now? Since it's hard to keep their various careers straight — it's kind of like trying to plan something in a group text, with everyone's varying schedules and all — let's compile all the guys' post-1D lives (yes, Malik included) into one organized list. Since the 1D hiatus, Styles has transitioned from boy band hottie to serious actor with his role in the WWII drama Dunkirk. He also reportedly signed a solo deal with Columbia Records, and, as seen above, is serving some serious Mick Jagger and Beatles-esque realness on the various covers of AnOther Man. There's also an entire spread of his ~modeling~ shots in the mag, and it's safe to say that the guy looks better than ever (if that's even possible). Styles has kept his personal life pretty close to the vest, but there are persistent rumors that he's back with Kendall Jenner, his yacht-sailing partner and maybe-FWB. He also chopped off his hair for charity (and also for Dunkirk and the AnOther Man spread). Horan is the second member of One Direction to release any solo material — and the first to do so while technically still in the band. Surprise, indeed: The sole Irishman of the group dropped the very acoustic and very Niall "This Town" on Sept. 29, and told SiriusXM that it's the first and only song off of his upcoming album (!) that is finished so far. He's also been golfing like crazy, competing in multiple competitions. Rumor had it that Horan was dating Belgian model Celine Helene Vandyke over the summer, but he recently told SiriusXM that his love life is "nonexistent, currently." Even more good news? He's still besties with Luke Hemmings from 5SOS, so day = made — for me, at least. Malik (clearly) got a head start on the whole solo career thing, leaving the band in March 2015 to become a "normal 22-year-old," one who dropped his first solo album, Mind of Mine, a year to the day after quitting the band. The "Pillowtalk" singer has also been exploring other entertainment ventures as of late: He's releasing a book in November ("a photographic journey," to be more specific), and he's developing a boy band TV drama for NBC. After quitting 1D, Malik also ended things with his fiancée, Perrie Edwards, and has been dating Gigi Hadid since November 2015. He's also been open about suffering from anxiety so severe that he's unfortunately had to cancel several of his performances. In July, Payne announced that he signed a record deal with Capitol Records, and became the first one of the guys technically still in the band to sign a solo deal. Though fans have yet to hear any music from Payno (cmon, Liam!) I imagine some #SoloLiam material isn't too far away. Payne has been happily dating X Factor judge and singer Cheryl since December 2015, and — despite that age difference (Cheryl is 10 years older than the singer and, awkwardly enough, has known him since he was 14) — the two seem blissfully in love. Tomlinson hasn't made any moves for a solo (singing) career yet, but it looks like he's getting into the judging side of singing competitions, appearing as a guest judge on both The X Factor UK and America's Got Talent. It's a smart move for a guy who maybe didn't have the strongest vocals in the band, but does have a ton of experience both in the music industry and in singing competitions (after all, he got his start with the rest of the guys on X Factor). What a whirlwind of a time Tomlinson has had in his personal life. He became a father to little Freddie Reign in January 2016, and has been dating girlfriend Danielle Campbell since December 2015. Juggling those two major life events (along with arranging custody with Briana Jungwirth, Freddie's mom), Tomlinson's private life is certainly overflowing. Now, as to when (or if) One Direction will ever get back together — that remains to be seen. In the meantime, there are enough exciting things happening in each of the guys' solo careers (and personal lives!) for fans to support without feeling deprived. And remember: One Direction started out as five individual guys auditioning as solo acts, so they each deserve their time in the limelight. And that time is now.